"Profi Plus" comprises over 100 different kitchen gadgets which satisfy the stringent requirements of professional chefs. The heavy design in Cromargan® stainless steel rustproof 18/10 is absolutely sturdy and durable, watertight, guaranteed to be dishwasher safe - simply indestructible. The sophisticated and at the same time timeless design would be at home in any kitchen. 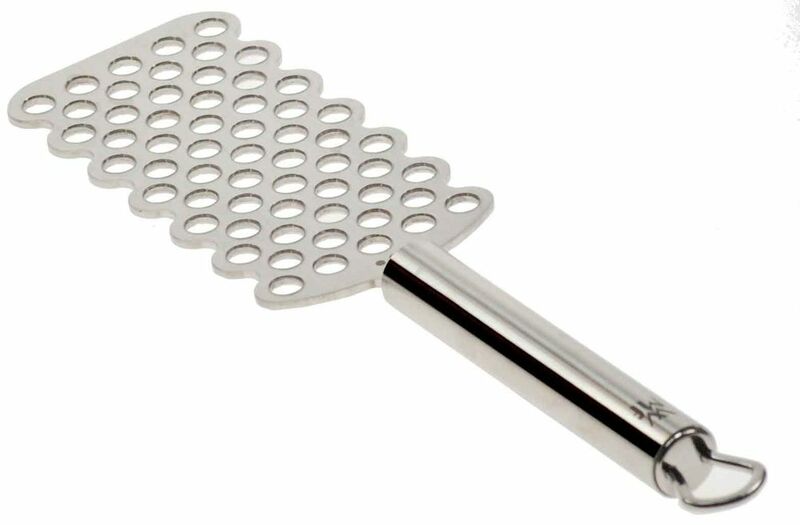 With the parmesan grater from Profi-plus, you can grate the cheese over your pasta directly at the table. This means you only grate as much parmesan as you actually need - which saves money. The cheese can be stored much better unsliced and keeps its aroma for longer this way. The parmesan grater grates cheese not only into powder but also into light flakes. other types of hard cheese such as Pecorino and Bergkase can also be grated with the Parmesan grater from Profi-Plus. THe Parmesan grater has a practical hanging loop so that it can be hung up on a rack or hook to save space. Cromargan® is the registered trademark of WMF for 18/10 stainless steel. Steel is refined by the incorporation of other metals which increases its utility. Cromargan® is an alloy of 18% chrome, 10% nickel and 72% steel. Chrome makes the material stainless; nickel makes it acid-resistant and adds gloss. The composition guarantees best usage properties. Cromargan® cutleries are dimensionally stable, neutral in flavour and food acid-resistant. They are hygienic, easy to clean and, of course, dishwasher-safe.